Purpose The purpose in this study was to compare endoscopic calcaneoplasty with a standard open technique in Haglund’s syndrome management. Patients and methods Two or three portal endoscopic calcaneoplasty was done in 14 patients (17 heels; nine females and five males), with a mean age of 29.7 years, and open calcaneoplasty using a lateral approach was done in 12 patients (17 heels; eight females and four males), with a mean age of 32.6 years. All patients had Haglund’s deformity on radiography and were resistant to conservative therapy for more than 6 months. All patients were evaluated preoperatively and postoperatively with the American Orthopaedic Foot and Ankle Society (AOFAS) score (Ankle–Hindfoot Scale). Results In the endoscopic group, the AOFAS scores averaged 63.4 points preoperatively and 88.5 points postoperatively (P<0.001) at an average of 16 months (range: 12–23 months) of follow-up. In the open technique group, the AOFAS scores averaged 61.1 points preoperatively and 80.6 points postoperatively (P<0.001), at an average of 20 months (range: 16–28 months) of follow-up. The scores after the endoscopic procedures were better than those after the open procedures. The time to recovery was similar in the two groups, but the endoscopic procedures were performed more quickly than the open procedures (50 min compared with 68 min) and were associated with fewer complications (0% compared with 1% regarding rate of infection, 5.8% compared with 23% regarding rate of altered sensation, and 5.8% compared with 17.6% regarding rate of scar tenderness). Conclusion Endoscopic technique for treatment of Haglund’s syndrome seemed to be a safe and efficient as the open technique and has the advantage of small incisions with better cosmetic appearance, less risk to weaken the Achilles tendon insertion that can cause tendon rupture, and also fewer wound complications such as dehiscence, painful or ugly scars, nerve entrapment within the scar, and hypoesthesia. Haglund’s disease, deformity, syndrome, or pump bump is a complex of symptoms including superolateral calcaneal prominence, retrocalcaneal bursitis, and superficial adventitious Achilles tendon bursitis More Details . The retrocalcaneal bursa is present posterior and superior to the calcaneus and allows smooth gliding of the Achilles tendon in dorsiflexion and plantar flexion . Haglund’s syndrome is a common problem. Patient complaints include superolateral calcaneal prominence, Achilles tendon tightness, and pain and stiffness at the posterior aspect of the heel. By examination, there is usually equinus. Imaging should include a lateral and axial calcaneal radiography . The bony exostosis is smaller in radiography than in the clinical and arthroscopic examination because of the cartilaginous cap. Normally the lateral angle between plantar and posterior border of the calcaneus is a tapered angle (<69); an angle above 75 is significant for a Haglund’s exostosis . A variety of procedures for treatment of retrocalcaneal bursitis are in use. These include nonoperative as well as surgical methods. Nonoperative treatment includes avoidance of tight shoes, activity modification, NSAIDs medication, physical therapy, and retrocalcaneal space injection . It must be noted that Haglund’s syndrome should not be treated surgically until all conservative measures for 6 months have failed to relieve the patient’s symptoms . The target of operative treatment is relief of symptoms by adequately removing the bony exostosis, decreasing irritation to the Achilles insertion. This can be done using lateral or medial incision which allows limited access to the contralateral aspect of the calcaneal which may result in inadequate bone resection and recurrence of symptoms. Moreover, these incisions do not allow easy access to the anterior aspect of the Achilles tendon . Splitting Achilles tendon approach allows excellent exposure of the tendon, facilitating adequate debridement of the tendon and bursa, but there is concerns regarding integrity of the tendon, with slow return to full function and scar irritation about the heel counter . During the last few decades, arthroscopic techniques have been substituted for open operative techniques in many disease states to avoid complications associated with open surgical techniques ,. The purpose of this study is to compare the open surgical technique using a lateral approach with the technique of endoscopic calcaneoplasty and to report the results of the patient series. In this study, two approaches to do calcaneoplasty for recalcitrant Haglund’s deformity were compared regarding effectiveness ([Table 1]). The IRB/Ethics committee in our institution approved this study. Two or three portal endoscopic calcaneoplasty was done in 14 patients (17 heels; nine females and five males), and open calcaneoplasty using a lateral approach was done in 12 patients (17 heels; eight females and four males) ([Table 1]). All patients showed a Haglund’s syndrome on radiography and were resistant to conservative therapy for more than 6 months. In all patients, it was confirmed that Achilles tendon shows no visible calcification. All patients were evaluated preoperatively and postoperatively with the American Orthopaedic Foot and Ankle Society (AOFAS) score (Ankle–Hindfoot Scale). The mean age of the patients in the endoscopic calcaneoplasty group was to a large extent similar to that of the lateral approach group, with a mean age of 29.7 years (range: 26–52 years) versus 32.6 years (range: 24–56 years), respectively. The mean time from onset of symptoms to surgery in the endoscopic calcaneoplasty group and lateral incision group was 24 months (range: 11–49 months) and 22 months (range: 13–54 months), respectively. The mean follow-up period was 16 months (range: 12–23 months) for endoscopic calcaneoplasty group and 20 months (range: 16–28 months) for the open lateral approach group. All patients included in the study were available for follow-up. Patients unavailable for follow-up were not included in the study. Patients undergoing calcaneoplastys either endoscopic or open were placed in the prone position. The procedure is done under spinal anesthesia. A tourniquet was applied at the thigh. The affected foot was positioned to be hanging freely over the edge of the operating table. Dorsiflexion of the foot was controlled by the surgeon’s body or the assistant. A two or three portal endoscopic technique was performed in the first group of patients ([Figure 1]a and [Figure 1]h), and a lateral approach open calcaneoplasty was performed in the other group ([Figure 2]c). Figure 1 Endoscopic technique. (a) Portal placement. (b) Lateral radiography of the calcaneus before surgery. (c, d) Two preoperative magnetic resonance images showing significant bursal formation and the superolateral calcaneal prominence. (e, f) Lateral intraoperative radiography of the calcaneus showing the superolateral calcaneal prominence before and after excision. (g) Lateral radiography of the calcaneus after surgery. (h) Postoperative photograph showing the portals. Figure 2 Open technique. (a) Lateral radiography of the calcaneus before surgery. (b) Lateral radiography of the calcaneus after surgery. (c) Postoperative photograph showing the lateral incision. In patients undergoing a two or three portal endoscopic technique (as needed for the case), we establish two lateral portals, a distal posterolateral portal (DPLP) and proximal posterolateral portal, and the third portal is the distal posteromedial portal (DPMP) ([Figure 1]a and [Figure 1]h). Approximately 0.5-cm long vertical incision for the proximal posterolateral portal was established directly lateral to the Achilles tendon and 5-cm proximal to its insertion. The skin only was incised, and a mosquito clamp was used to spread the subcutaneous tissue. Blunt dissection of the retrocalcaneal space was done using a blunt trocar, then a 4 mm, 30° endoscope was inserted. Two distal portals at the level of the superior aspect of the calcaneus directly adjacent to the Achilles tendon were created, a DPMP and a DPLP. Resection of the inflamed retrocalcaneal bursa was performed under direct endoscopic vision using a 4-mm shaver through the DPMP and the DPLP. For better visualization of the posterosuperior calcaneal prominence, change between different portals was sometimes necessary. Arthroscopic examination of the deformity shows a fibrous cartilage covering the calcaneal prominence and the anterior aspect of the Achilles tendon forming a joint-like structure. The impingement location was determined when the foot was maximally dorsiflexed. Under direct observation, a bur was inserted through the DPMP or DPLP to perform the calcaneoplasty with the foot maximally plantar flexed. The medial and lateral areas of the calcaneal prominence were removed where portals were interchanged to perform adequate bony resection. The closed side of the bur was directed to the side of the Achilles tendon to prevent damage to the tendon. The extent of bony resection was judged in the first cases by radiology (C-arm) ([Figure 1]e and [Figure 1]f), but later on and with improvement of the learning curve, this was done completely arthroscopically with the ankle moving through a full range of motion with only one lateral radiographic view for confirmation at the end of the procdure. Elimination of impingement in maximal dorsiflexion of the foot indicated adequate removal of bone. Patients treated with open techniques using a lateral approach ([Figure 2]) had a 6- to 8-cm lateral incision along the lateral border of the Achilles tendon insertion ([Figure 2]c). Full-thickness skin flaps were made to the tendon. The insertion of the Achilles tendon was identified along the lateral border and retracted exposing the prominent calcar tuber, which was resected using a half-inch curved osteotome, and then the edges were smoothed with a rongeur and curette. At the end of either endoscopic or open procedure, below knee cast was applied in plantar flexion. Postoperatively, patients were encouraged to perform elevation of the foot for the first week. In patient group treated with open technique, partial weight bearing was performed for the first 2 weeks with the foot in the cast, and then the cast was removed allowing gradual range-of-motion exercises and full weight bearing in the third week. In patient group treated with endoscopic technique, the cast was removed after 1 week with encouragement of the patient to do full weight bearing as tolerated. In both groups, conventional footwear was not allowed to be worn during the first 8 weeks, and physical activities were not allowed before 3 months. In the endoscopic group, the AOFAS scores averaged 63.4 points preoperatively and 88.5 points postoperatively (P<0.001) at an average of 16 months (range: 12–23 months) of follow-up. In the open technique group, the AOFAS scores averaged 61.1 points preoperatively and 80.6 points postoperatively at an average of 20 months (range: 16–28 months) of follow-up (P<0.001) ([Table 2]). The time to recovery was similar in the two groups, but the endoscopic procedures were performed more quickly than the open procedures, 50 min (range: 40–84 min) compared with 68 min (range: 60–80 min) ([Table 2]). Learning curve was steep, and the last three cases were performed in 40 min. In the first cases, we used the C-arm during the procedure to determine the amount of bony resection. In the last cases, we documented the calcaneus lateral view only at the end of the procedure. All patients showed clinical improvement and would undergo for the same procedure again. Postoperative radiographic follow-up showed sufficient bone removal with resection of the calcaneal prominence in all cases in both groups. There were no intraoperative complications. 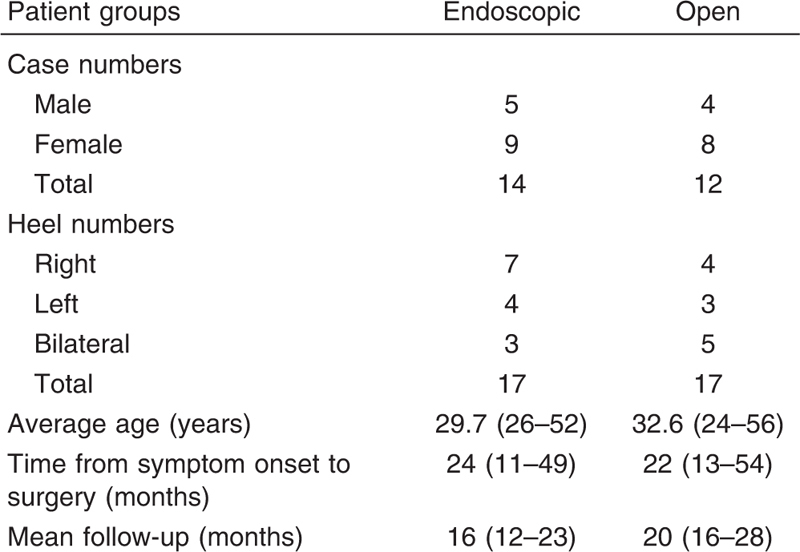 The postoperative complications in endoscopic group were fewer compared with the open group ([Table 2]). Swelling was noted up to 3 months after surgery without any problem to the patient in both groups. The protocol was to stay on crutches for at least 2 weeks and to increase weight bearing slowly. Patients who followed this protocol recovered within 2–6 weeks. Owing to the small incisions in the endoscopic group, two patients started, against the medical advice given to them, full weight bearing within the first 5 days without any complications except for swelling, which persisted for ∼12 weeks. Haglund’s syndrome is usually treated initially nonsurgically, and treatment includes heel lift, shoe modifications, stretching exercises, activity modifications to include avoiding hills and stairs and repetitive activities, orthotics, night splint to achieve a prolonged stretching benefit, cast immobilization, shockwave therapy, and a course of physical therapy. Resistant cases after 3–6 months of nonoperative treatment should be treated operatively . Infiltration into the retrocalcaneal bursa with corticosteroids should be done after other treatments have failed. Repeated injections are not advised as this caries a potential danger of rupture of the Achilles tendon . The surgical treatment of Haglund’s syndrome measures aims at preventing impingement of the bursa between the Achilles tendon and calcaneus which can be done through removal of the inflamed retrocalcaneal bursa followed by resection of the superoposterior bony prominence. This can be performed via a endoscopic or open techniques . The open operative treatment of retrocalcaneal bursitis requires good exposure to remove an adequate amount of bone. A large exposure, however, is accompanied by a significant percentage of wound and soft-tissue problems. Some surgeons using the open technique advise postoperative plaster immobilization which carries the subsequent risk of new adhesions and scar tissue formation . The endoscopic treatment of Haglund’s syndrome allows for excellent lateral and medial visualization. Moreover, it allows best inspection of the Achilles tendon and its insertion, minimizing the possibility of injuring the tendon, thus permitting early functional rehabilitation leading to decreased complications such as stiffness and pain ,. Leitze et.al. compared endoscopic and open treatment for Haglund’s syndrome and found that regarding the AOFAS, the scores after the endoscopic procedures were numerically, but not significantly (P=0.115), better than those after the open procedures with a simillar time to recovery in the both groups, but the endoscopic procedures were performed more quickly than the open procedures (44 min compared with 56 min) and were associated with fewer complications. Lohrer et al. , their controlled laboratory study evaluated the morphologic appearance of the superior portion of the calcaneal tuberosity after endoscopic or open resection. They resected tuberosity in 15 isolated fresh-frozen human cadaver lower limb specimens with either open (nine) or endoscopic (six) technique. They measured the outcome radiographically which revealed that the slope of the resection line (osteotomy angle) was steeper (P=0.017) and the resected protuberance was larger (P=0.003), whereas the remaining posterior rim was smaller (P=0.048) after open resection than after endoscopic resection. Moreover, they evaluated iatrogenic soft-tissue lesions of the distal Achilles tendon, plantaris tendon, and sural nerve caused by the surgical procedure by direct observation after anatomic dissection where they concluded that both approaches may damage soft tissues particularly in the medial Achilles tendon column and in the plantaris tendon, with iatrogenic sural nerve injuries found after both techniques (relative risk=0.2 for endoscopic and 0.1 for open resection). Moreover, they detected residual bursa tissue only after endoscopy (relative risk=0.3), whereas loose bony fragments were present only after open surgery (relative risk=0.4) . Endoscopic technique for treatment of Haglund’s syndrome seemed to be a safe and efficient as the open technique and has the advantage of small incisions with better cosmetic appearance, less risk to weaken the Achilles tendon insertion that can cause tendon rupture, and also fewer wound complications such as dehiscence, painful or ugly scars, nerve entrapment within the scar, and hypoesthesia. Pavlov H, Heneghan MA, Hersh A. The Haglund syndrome: initial and differential diagnosis. Radiology 1982; 144:83–88. Myerson MS, McGarvey W. Disorders of the insertion of the Achilles tendon and Achilles tendinitis. An instructional course lecture. J Bone Joint Surg 1998; 80A:1814–1824. Franson J. Some new ideas in the treatment of retrocalcaneal exostosis. Foot Ankle Spec 2008; 1:309–311. Nesse E, Finsen V. Poor results after resection for Haglund’s heel. Analysis of 35 heels in 23 patients after 3 years. Acta Orthop Scand 1994; 65:107–109. Jerosch J, Schunck J, Sokkar SH. Endoscopic calcaneoplasty (ECP) as a surgical treatment of Haglund’s syndrome. Knee Surg Sports Traumatol Arthrosc 2007; 15:927–934. Anderson JA, Suero E, O’Loughlin PF, Kennedy JG. Surgery for retrocalcaneal bursitis: a tendon-splitting versus a lateral approach. Clin Orthop Relat Res 2008; 466:1678–1682. McGarvey WC, Palumbo RC, Baxter DE, Leibman BD. Insertional Achilles tendinosis: surgical treatment through a central tendon splitting approach. Foot Ankle Int 2002; 23:19–25. Keck SW, Kelly PJ. Bursitis of the posterior part of the heel: evaluation of surgical treatment of 18 patients. J Bone Joint Surg Am 1965; 47:267–273. Van Dijk CN, van Dyk CE, Scholten PE, Kort NP. Endoscopic calcaneoplasty. Foot Ankle Clin 2006; 2:439–446. Wu Z, Hua Y, Li Y, Chen S. Endoscopic treatment of Haglund’s syndrome with a three portal technique. Int Orthop 2012; 36:1623–1627. Leitze Z, Sella EJ, Aversa JM. Endoscopic decompression of the retrocalcaneal space. J Bone Joint Surg Am 2003; 85:1488–1514. Lohrer H, Nauck T, Dorn NV, Konerding MA. Comparison of endoscopic and open resection for Haglund tuberosity in a cadaver study. Foot Ankle Int 2006; 27:445–450.